The name "Cavite" evolved from the word "Kawit" or "Cauit," meaning hook, referring to the shape of the land along the coast of Bacoor Bay. It was mispronounced by the Spaniards as "Kawite" or "Cavite" there being no "K" in the Castillan alphabet, then changing "w" to "v" so as to conform to their accentuation. There are several names attributed to present-day Cavite City. Its early settlers, who were Tagalogs, called it "Tangway," meaning peninsula. People from other places refer to it as Kawit, because it looked like a sharp-edge part of the hook-shaped land along the coast of Bacoor Bay. The Chinese traders or the Sangleyes who came to Cavite to do business with the natives called it Keit, a corruption of the word Kawit. According to folklore, the earliest settlers came from Borneo, led by Gat Hinigiw and his wife Dayang Kaliwanag who bore seven children. Archaeological evidences in the coastal areas show prehistoric settlements. When Spanish colonizers settled in the most populated area of the place (the present day Kawit), they called it as Cavite, another corruption of the word Kawit. The old Tangway, which was at its northern tip, was called "Cavite la Punta" meaning "Tip of Cavite". When they discovered Cavite la Punta to be a suitable place for the repair of their ships and galleons, they called the place Cavite Nuevo (New Cavite) and moved their settlement there. 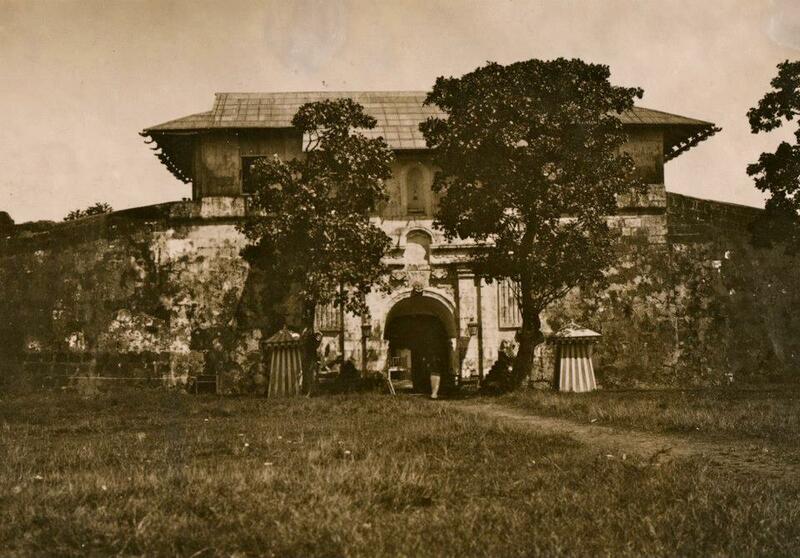 In 1614, the Spaniards fortified the place with Muralla (high thick walls) and surrounded it with moats, the place was called Puerto de Cavite (port of Cavite). Cavite City was given royal encomienda or land grant on May 16, 1571 by the Spanish conquistador Miguel López de Legazpi, which was named Cavite la Punta. Cavite la Punta was christened Cavite el Puerto also known as Cavite Nuevo, when the Spaniards discovered that Cavite la Punta was a suitable place for the repair and construction of their ships and galleons. Puerto de Cavite was linked to the history of world trade. Spanish galleons sailed every July to Acapulco, Mexico. Between 1609 and 1616 the galleons Espiritu Santo and San Miguel were constructed in the shipyard of Puerto de Cavite. In 1590 the surrounding walls and Fuerte Guadalupe on the south side were built. The forts of San Felipe Neri and Porta Vaga were constructed in 1595 and completed in 1602. It was also a haven for churches, convents and hospitals. The Franciscan Hospital de San Jose was built for sailors and soldiers in 1591, the San Diego de Alcala convent in 1608, the Porta Vaga (La Ermita), San Juan de Dios, Santo Domingo, Santa Monica (Recolletos) and San Pedro, the port's parish church. Plazas and parks were evidence of importance, Plaza de Armas across from San Felipe Fort, Plaza de San Pedro across from the church and Plaza Soledad across from Porta Vaga, Plaza del Reparo was at the bayside. At the height of the Manila-Acapulco Galleon Trade, which made Puerto de Cavite the point of entry and departure of Spanish galleons that brought many foreign travelers on its shores, Puerto de Cavite was fondly called "Ciudad de Oro Macizo" meaning the "City of Solid Gold". The Chinese emperor at one time sent some of his men to this place to search for gold. It was also during those times when it was called "Tierra de Maria Santisima" because of the popularity of the Marian devotion in this place. The early inhabitants of Cavite City were the Tagalogs ruled by the Kampilan and the bullhorn of a datu, the tribal form of government. During the Spanish administration, the place was under an "Administradores Civiles" called "Gobernadorcillo", which was later called "Capitan Municipal", assisted by a "Teniente Mayor", a "Teniente Segundo", a "Teniente Tercero", a "Teniente del Barrio" and a "Cabeza de Barangay". 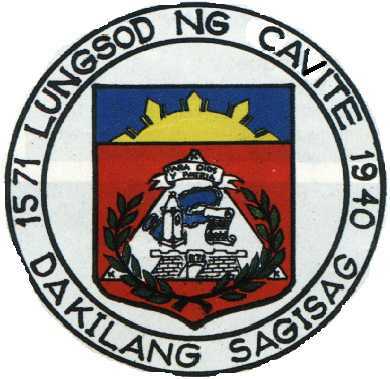 Cavite City was founded as a town in 1614. San Roque was added and founded as a town also in 1614. It was placed under the civil administration of Cavite el Puerto until it was granted a right to be a separate and an independent pueblo in 1720. La Caridad, formerly known as La Estanzuela of San Roque, separated and was founded as town in 1868. The Spanish Governor General Jose de la Gardana granted the petition of the people led by Don Justo Miranda to make barrio La Estanzuela an independent town. At the start of the American colonial period, the place was used as the seat of the U.S. Naval Forces in the Philippines. Government Administration was under the Presidentes Municipales with the direct supervision of the American Army Officers (the first being Colonel Meade). The first Filipino "Presidentes Municipales" were appointed: Don Zacaria Fortich for Puerto de Cavite, Don Francisco Basa for San Roque, and Don Pedro Raqueño Bautista for Caridad. In 1900, the Caviteños tasted their first election under the American regime. They elected in each pueblo or town, local officials called Presidente Municipal, Vice-Presidente Municipal and a Consejo composed of Consejales. In 1901, the Philippine Commission approved a municipal code as the organic law of all local governments throughout the country. 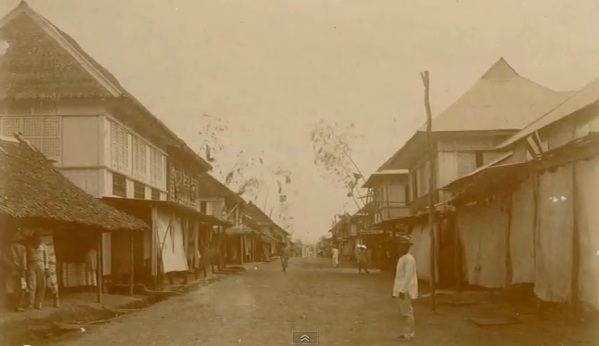 In its implementation in 1903, the three separate pueblos of Cavite Puerto, San Roque and La Caridad were merged into one municipality, which was called the Municipality of Cavite. By virtue of a legislative act promulgated by the First Philippine Assembly, Cavite was made the capital of the province. Subsequently its territory was enlarged to include the district of San Antonio and the island of Corregidor. The Municipality of Cavite functioned as a civil government whose officials consisted of a Presidente Municipal, a Vice-Presidente Municipal and ten Consejales duly elected by the qualified voters of the municipality. Under the Philippine Commonwealth, Assemblyman Manuel S. Rojas, Grand Father of Mayor Bernardo Paredes, sponsored Commonwealth Act No. 547 creating Cavite as a chartered city. Upon approval into law on September 7, 1940, the executive function of the city was vested on an appointive City Mayor who holds office at the pleasure of the President of the Philippine Commonwealth. Moreover, legislative functions as provided for in the charter of the City of Cavite was vested on a Municipal Board composed of three electives, two appointive and two ex-officio councilors, the presiding officer of which is the City Mayor. In 1941, Japanese Imperial Forces bombed the city to destroy the US Naval Installations. The Japanese appointed at least two City Mayors of Cavite City. Again in 1945, the US and Philippine Commonwealth military bombarded the Japanese forces stationed here. After the liberation, the city's local administration went back to normal. Republic Act No. 981, passed by the Congress of the Philippines in 1954, transferred the capital of the Province from Cavite City to Trece Martires City. Subsequently, the City Charter was amended. By virtue of an amendment to the charter of Cavite City, the City Mayor, City Vice-Mayor and eight councillors were elected by popular suffrage. The first election of city officials was held in 1963. Nuestra Señora de la Soledad de Porta Vaga is the patroness of Cavite City and the entire Province of Cavite, also called "Reina de Cavite" and "La Virgen de la Soledad". The virgin is depicted as a lady in mourning. Mary, garbed in black and white attire, seems to be on her knees as she contemplates the passion of her son. Before her are the crown of thorns and the nails instrument of Christ's passion. The image of the virgin is painted on a canvas. An inscription was found at the back of the painting. A doze de Abril 1692 años Juan Oliba puso esta Stma. Ymagen Haqui, which means,"The sacred image was placed here by Juan Oliba on April 12, 1692". This particular icon was used to bless the galleon plying between Cavite and Acapulco (Mexico) during formal sending off ceremonies. Thus, she was called the Patroness of the Galleon. The most venerated image of La Virgen de la Soledad de Porta Vaga is an invaluable treasure inherited by the Caviteños from their antepasado (ancestors). This is the oldest existing dated Marian painting in the Philippines. The Virgen de la Soledad was acknowledged as the Celestial Guardian and Protectress of the entire province of Cavite and the port since her arrival in Cavite shore. The image was enshrined in another church named Ermita de Porta Vaga, until its destruction during the last world war. Today, the image of the Porta Vaga is presently enshrined in the Parish Church of San Roque, one of the three parishes in the City. Chavacano, sometimes spelled as Chabacano, is the language mostly spoken by majority of the Caviteños that lived in the city of Cavite, whose origin has begun during the arrival of the first Spaniards three centuries ago. Today only a fraction of Caviteños in the city of Cavite speak the Chavacano dialect, mostly elders, so perhaps it will come to cease of its existence or completely disappear in the near future. 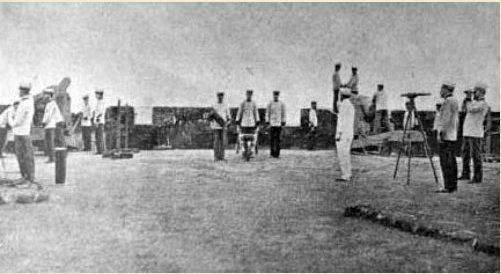 During the stay of the Spaniards near the military arsenal in Cavite City, the people that lived in the proximities of the arsenal put themselves in contact with the Spaniards and began to incorporate in their own dialect many Spanish words which gave birth to a Hispanic - Philippine dialect called "Chabacano" of long ago and of today. According to many opinions, Chavacano was scattered in different places of the Philippine archipelago, only of its sort in the Far East or perhaps in the Hispanic world. One of the poets and Philippine writers, Jesus Balmori expressed himself in Chabacano. He was a great admirer of the dialect and wrote several verses in it. Another admirer of this dialect was Don Jaime de Veyra, the illustrious writer and famous Philippine historian, who feared more than all the probable extinction of the Chabacano when he wrote the following prophetic lines, "I am afraid that the inevitable absorption of the tagalismo on one side and the invasion of the anglicism on the other hand, will wipe out or extinguish this inherited Castilian language in existence with his last representatives in the following generation." And, according to the Philippine catedratico, Alfredo B. German who wrote a thesis on the grammar in Chabacano dialect, the present conditions no longer favor the disenrollment of the same one. There are many reasons for the probable disappearance of the Chabacano dialect, but the main thing is the massive arrival of the Tagalog speaking people in the city of Cavite. The educated class has scorned the Chabacano dialect, refusing to speak it or replace it with the Tagalog language. Professor Gervacio Miranda who also wrote a book in Chabacano said in his preface the following thing,"My only objective to write this book is to possibly conserve in written form the Chavacano of Cavite for posterity," fearing the extinction of the dialect. Nowadays, in the same city of Cavite, it still exists. Nonetheless very few Caviteños speaks of this hybrid language. The survival of this dialect depends on their people, the Caviteños of the city of Cavite, who have inherited this dialect from their ancestors. Some now live in Olongapo City and so far there are only less than 500 people who could speak this language, mostly the elders. Chavacano is spoken by a majority in Zamboanga City. Cavite Navy Yard. Officer’s Gate, 1901.